Home Tags Posts tagged with "walmart lawsuit"
Tracy Morgan has settled the lawsuit against supermarket giant Walmart over a crash which left him seriously injured, and killed his friend, comedian James McNair. In June 2014, a Walmart truck crashed in to the back of Tracy Morgan’s limo. Prosecutors alleged the driver had not slept for more than 24 hours. James McNair, known as Jimmy Mack, was killed in the crash. 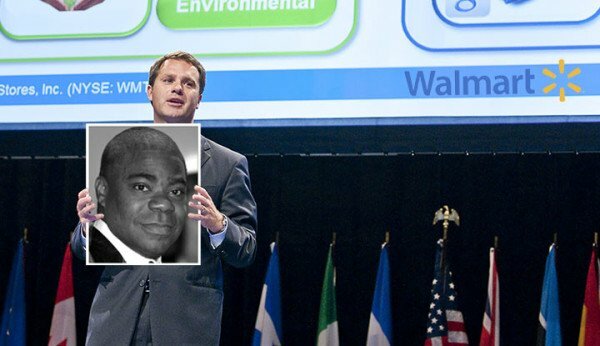 Tracy Morgan’s lawyer, Benedict Morelli, said Walmart “took full responsibility for the accident”. All sides had worked hard to reach the undisclosed agreement, the lawyer added. Tracy Morgan said Walmart “did right by me and my family, and for my associates and their families”. A representative for Walmart also called it an “amicable settlement”. Tracy Morgan, 46, was left in a critical condition following the crash, suffering a traumatic head injury, a broken leg, nose and ribs. The 30 Rock star will give his first interview since the crash to NBC’s Today on Monday, June 1. Tracy Morgan will be interviewed by Matt Lauer live in the Rockefeller Center – which was the setting for 30 Rock – and will be joined by his lawyer Benedict Morelli. Walmart had previously reached an agreement with the family of James McNair, 62, who grew up with Tracy Morgan in New York. Walmart driver Kevin Roper of Jonesboro, Georgia, has pleaded not guilty to death by auto and assault and is currently on bail.